Home > December 2016 > Chit Funds of TN makes plea to central government for minimal levy in GST..! Chit Funds of TN makes plea to central government for minimal levy in GST..! Incorporated Chit Funds Association (ICFA), Tamil Nadu - member of All India Association of Chit Funds (AIACF), New Delhi - has made an appeal to the Central Government for unburdening the Chit Fund industry by levying minimal GST and amending the legislation for hassle-free procedures with respect to registration and functioning of the Chit Fund business. "The capacity of this Industry to cater to the Lower and Middle Income Households is quite substantial and will be possible only with the legislative and Administrative support. In the scenario of country's functioning of non-banking financial companies eased without such a tax burden, Chit fund sector also anticipates such a favor from the government," he added. "Also, it is to be noted that in the event of any fraudulence by unorganized finance companies it is always misquoted as Chit funds whose failure is a negligible 1% in reality. This damages the reputation of the industry among public. It is demanded that the state government take required steps to curb such misrepresentations," he remarked. Though we welcome the demonetization move, it is not easy for our customers to switch over to cashless transactions and finally resulting in poor collection of subscriptions thereby affecting the cash flow. The industry also expects subsequent revolutionary changes that will benefit the industry's sustainability and growth. we expect government's nod for the chit fund industry to engage themselves in other businesses like selling of insurances helping in generation of funds to the industry through fee-based service. Chit Fund supporting the livelihood of lower and middle income household is more of a Self-Help Group for them and not a service that could be subject to any tax. And with the conversion of Service tax to GST will add more to the owes of the industry. GST up to a maximum of 5% could only be a help to the Chits for its survival and deliver good to its dependable customers. Mr. T.S. Sivaramakrishnan, announced the demands during a press meet held in the city to announce the Golden Jubilee celebrations of ICFA to take place on 18th December at Trichy. Mr. M. V. Vaidyanathan, President, ICFA; Mr. A. Chitrarasu, Secretary, ICFA; Mr. Lion C. Rajagopalan, President, Tamil Nadu Chit Fund Companies Association, were present. Expecting representations from over 500 companies, the Golden Jubilee event will be graced by the presence of Thiru. Vellamandi Natrajan, Honourable Minister of Tourism, Tamil Nadu, as Chief Guest. Dr. S. Gurumurthy, Political & Economic Analyst and Founder of Swadeshi Jagaran Manch will deliver the key note address. Ms. Sailaja Kiron, MD, Margadarsi Chits; Dr. Mudit Kapoor, Associate Professor, ISI, New Delhi; Mr. Raja Krishnamurthy (Kitty), Motivational Speaker and HRD Consultant; and Dr. G. Sivaraman, MD, Arogya Sidhha Hospital, Chennai, will be present among other dignitaries. "ICFA is celebrating its golden 50th year in service and is a representative of chit funds organizations of South India. Since beginning it has been making various representations before the state and central governments and taking appropriate measures for sustainability and development of the industry that silently and largely contributes for financial inclusion. There are about 12,000 registered companies across India and its might in serving the financially marginalized and contribution for the inclusive growth of our country is immense, recording a turnover of over Rs. 35,000 crores annually" said Mr. M. V. Vaidyanathan. "Moreover, Chit funds are of less paper work and an easy means for the poor or illiterate people to save their hard-earned money and also get trouble-free financial back up any time and during their needs. 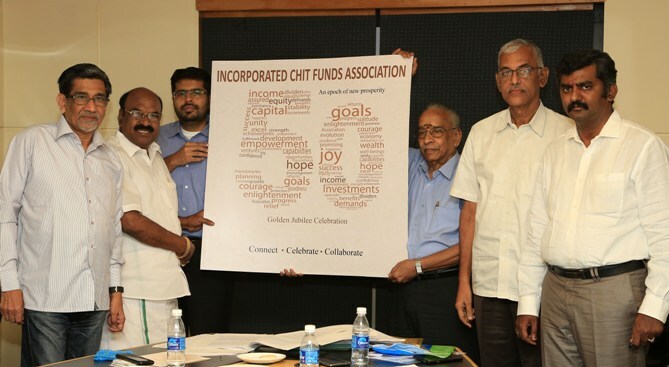 ICFA is proud celebrating its years of dedication to the advantage of Chit fund organizations as well as its service to the economically backward section of the society," he added. Media Contact: Mr. A. Chitrarasu, Secretary, Incorporated Chit Funds Association at 93800 44454.